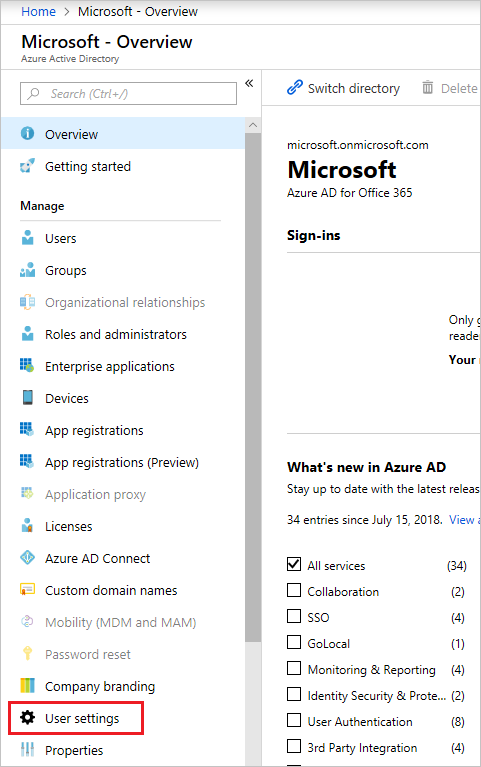 This article shows you how to create a new Azure Active Directory (Azure AD) application and service principal that can be used with the role-based access control. When you have code that needs to access or modify resources, you can create an identity for the app. This identity is known as a service principal. You can then assign the required permissions to the service principal. This article shows you how to use the portal to create the service principal. It focuses on a single-tenant application where the application is intended to run within only one organization. You typically use single-tenant applications for line-of-business applications that run within your organization. Instead of creating a service principal, consider using managed identities for Azure resources for your application identity. If your code runs on a service that supports managed identities and accesses resources that support Azure AD authentication, managed identities are a better option for you. To learn more about managed identities for Azure resources, including which services currently support it, see What is managed identities for Azure resources?. Let's jump straight into creating the identity. If you run into a problem, check the required permissions to make sure your account can create the identity. Provide a name and URL for the application. Select Web app / API for the type of application you want to create. You can't create credentials for a Native application. You can't use that type for an automated application. After setting the values, select Create. You've created your Azure AD application and service principal. To access resources in your subscription, you must assign the application to a role. Decide which role offers the right permissions for the application. To learn about the available roles, see RBAC: Built in Roles. You can set the scope at the level of the subscription, resource group, or resource. Permissions are inherited to lower levels of scope. For example, adding an application to the Reader role for a resource group means it can read the resource group and any resources it contains. Navigate to the level of scope you wish to assign the application to. For example, to assign a role at the subscription scope, select All services and Subscriptions. Select the particular subscription to assign the application to. 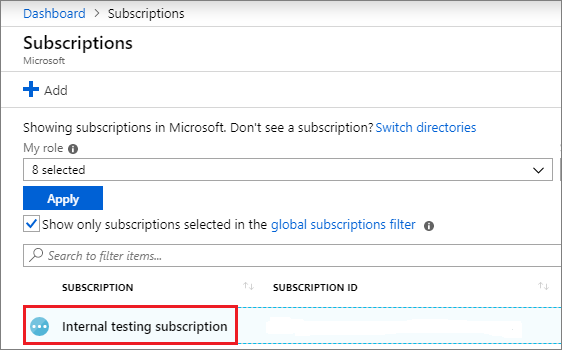 If you don't see the subscription you're looking for, select global subscriptions filter. Make sure the subscription you want is selected for the portal. Select the role you wish to assign to the application. To allow the application to execute actions like reboot, start and stop instances, select the Contributor role. 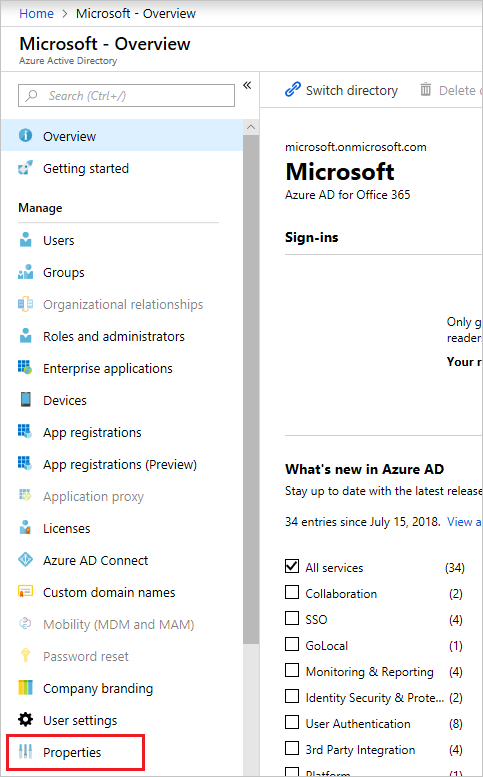 By default, Azure AD applications aren't displayed in the available options. To find your application, search for the name and select it. Select Save to finish assigning the role. You see your application in the list of users assigned to a role for that scope. Your service principal is set up. You can start using it to run your scripts or apps. The next section shows how to get values that are needed when signing in programmatically. 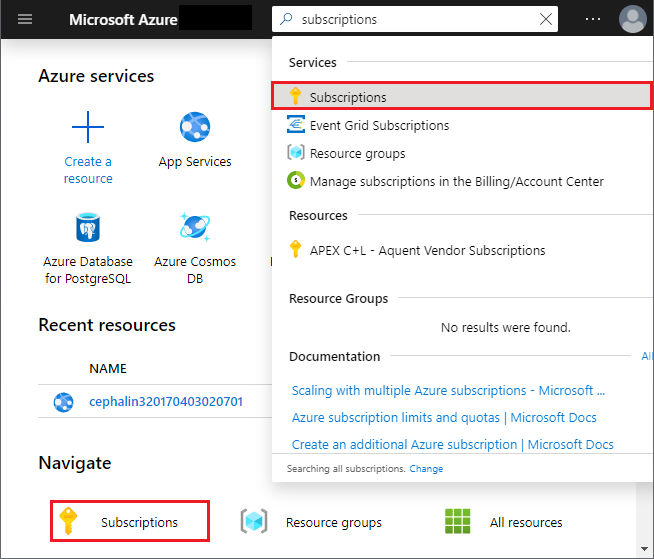 From App registrations in Azure AD, select your application. Copy the Application ID and store it in your application code. After saving the key, the value of the key is displayed. Copy this value because you aren't able to retrieve the key later. You provide the key value with the application ID to sign in as the application. Store the key value where your application can retrieve it. 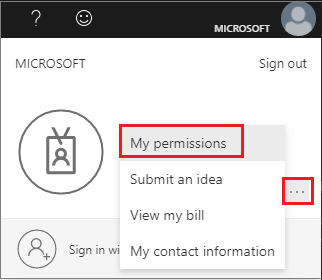 You must have sufficient permissions to register an application with your Azure AD tenant, and assign the application to a role in your Azure subscription. Note your role. If you have the User role, you must make sure that non-administrators can register applications. Check the App registrations setting. This value can only be set by an administrator. If set to Yes, any user in the Azure AD tenant can register an app. 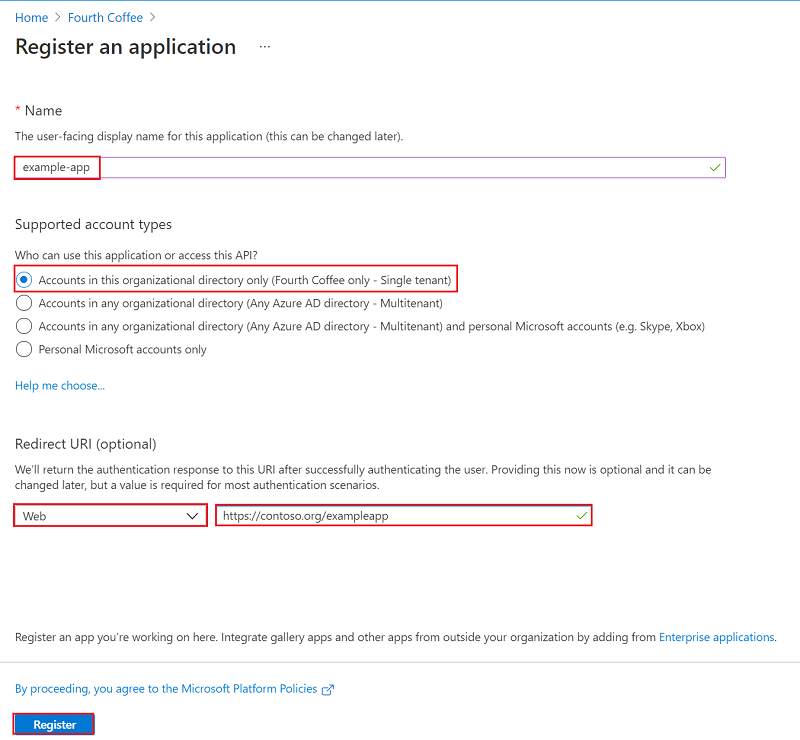 If the app registrations setting is set to No, only users with an administrator role may register these types of applications. 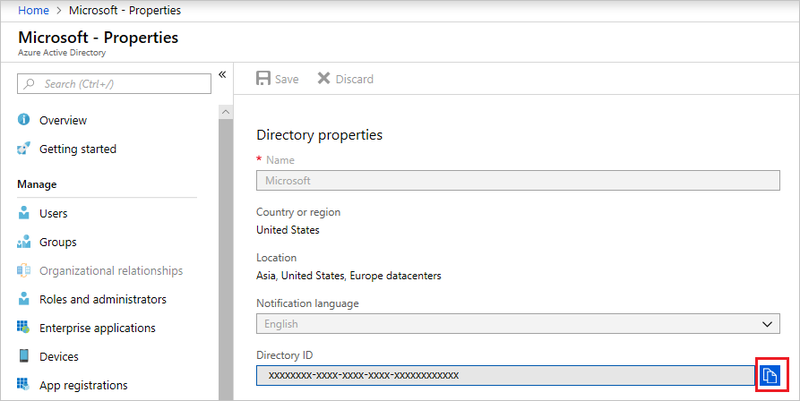 See available roles and role permissions to learn about available administrator roles and the specific permissions in Azure AD that are given to each role. 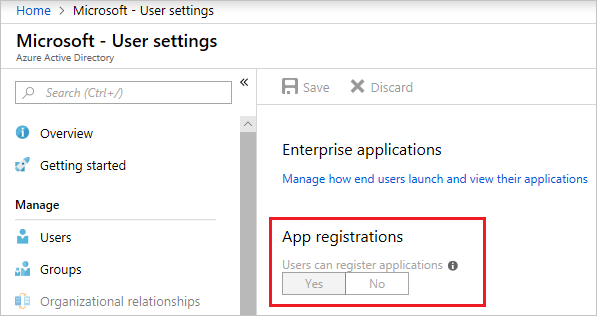 If your account is assigned to the User role, but the app registration setting is limited to admin users, ask your administrator to either assign you to one of the administrator roles that can create and manage all aspects of app registrations, or to enable users to register apps. In your Azure subscription, your account must have Microsoft.Authorization/*/Write access to assign an AD app to a role. This action is granted through the Owner role or User Access Administrator role. If your account is assigned to the Contributor role, you don't have adequate permission. You receive an error when attempting to assign the service principal to a role. Select your account in the upper right corner, and select My permissions. From the drop-down list, select the subscription you want to create the service principal in. Then, select Click here to view complete access details for this subscription. 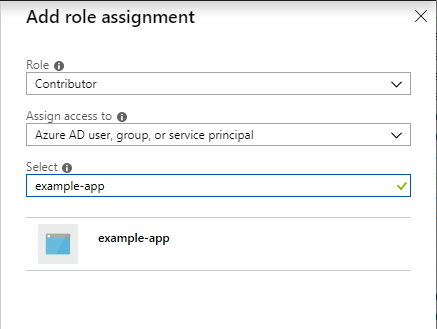 View your assigned roles, and determine if you have adequate permissions to assign an AD app to a role. If not, ask your subscription administrator to add you to User Access Administrator role. In the following image, the user is assigned to the Owner role, which means that user has adequate permissions. 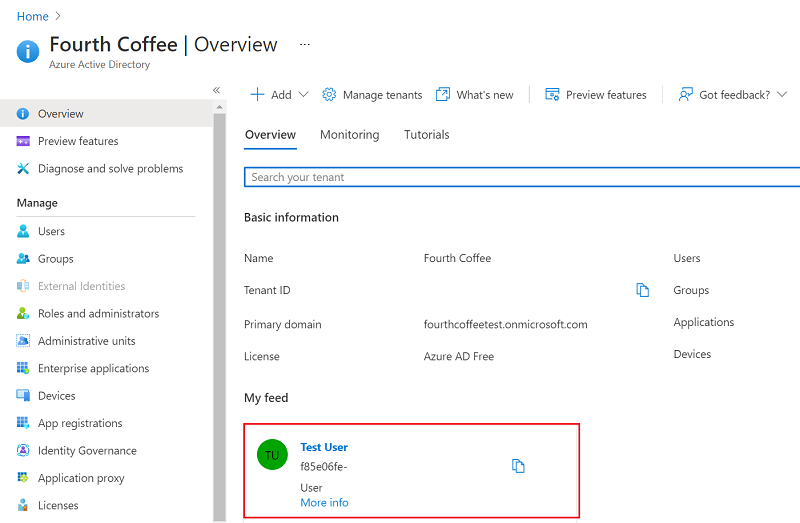 To set up a multi-tenant application, see Developer's guide to authorization with the Azure Resource Manager API. To learn about specifying security policies, see Azure Role-based Access Control. For a list of available actions that can be granted or denied to users, see Azure Resource Manager Resource Provider operations.